They are looking soo inviting. When are you giving us dinner? I will post my way of cooking bisibela bath sometime soon to share with you and others here. thanks a lot for the encouragement. I am happy that you are trying out the recipe at home. Pls do not forget to leave your comment on how it turned out. I will be posting more recipes. thanks once again. 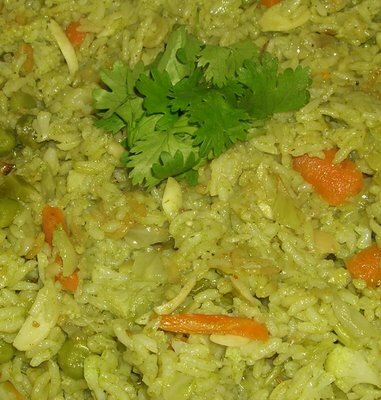 I like biryani rice...but vegetable birani? Interesting. This seems to be decently easy to try out. Shall let u know how it turned out after i try it. Great work! The blog is well organized and informative. Keep the recipes coming. Biryani looks wonderful.Orange,white and green!Pooja's round up colors this week.Send it her! I also tried the Cauliflower masala, that turned out well too. Thanks for taking the time to post your recipes along with the mouth watering pictures.